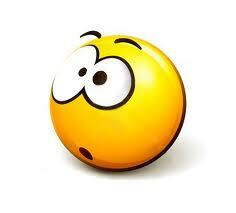 I know it’s been over a week since I’ve had anything to say, which is unusual for me (at least this past year). I had a bout of writer’s block and am hoping to be more inspired this week. I have a post up my sleeve for later this week (a Zoe Recommends, if you must know). However, it takes some forethought and planning–is that redundant?–and this is the first step. In order to avoid inundating you with way too many photos for a simple blog post, I decided to do this one first. And hey, since simple syrup can be used for so many recipes, I thought I’d share this illustration of it with you. Aren’t I so helpful? I am not a “cook.” I praise the Lord every day that my man not only cooks and grills skillfully (and sort of bakes, though I am the better baker) but loves to do so. So even the quickest thing that requires me to pull out pots and pans and like, “do stuff” on the stove, makes me kind of: Therefore, I surprised myself with the fact that I was able to make this “recipe” all by myself AND take photographs of it at the same time without totally screwing it up. Whee! 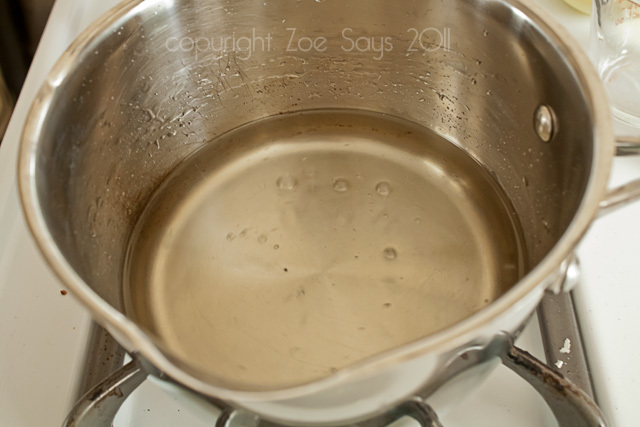 Simple syrup is most easily made with a 1:1 ratio of water to sugar. When it’s all said and done, you use it to make any preferred sweetened beverage. I know that sugar is blacklisted in many homes but it’s not like you’re going to drink this stuff straight from the jar. Or at least, you shouldn’t. Because I didn’t need to end up with two cups of the stuff, I opted to use only one cup of water and one cup of sugar, but it’s totally your prerogative. Let’s get our syrup on! 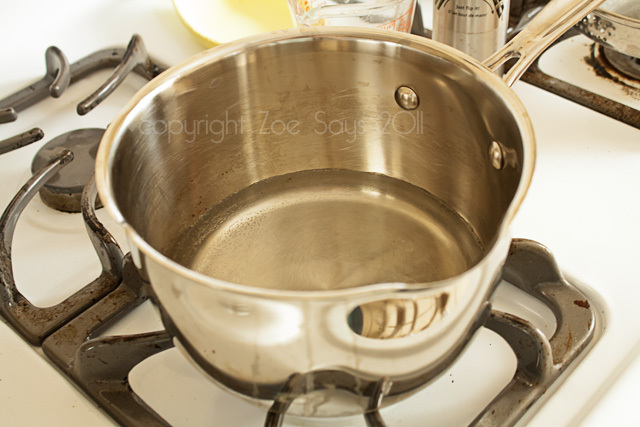 Step 1: place one cup cold tap water into pot. Easy enough. Step 2: boil said water. My little pot here came with a handy lid so I popped that on so the water would boil about ten times faster. Step 4: turn the heat down to low and stir the mixture constantly. You want to make sure the sugar is dissolving into the hot water or you’ll just end up with crunchy water. No good. Just keep stirring, just keep stirring. 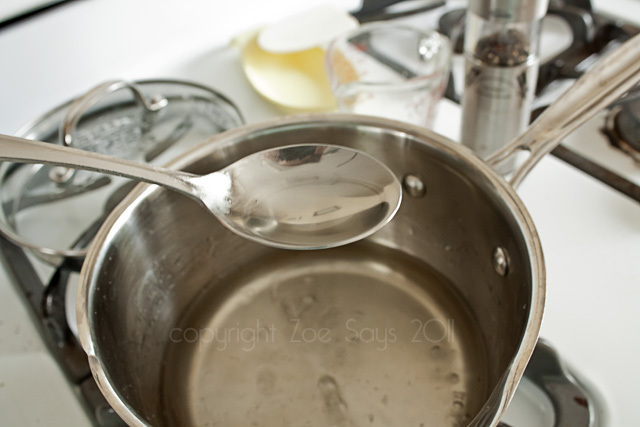 Then, when you’ve stirred a whole bunch more, test it with a metal spoon. Scoop from the bottom and bring the spoon up close for inspection. 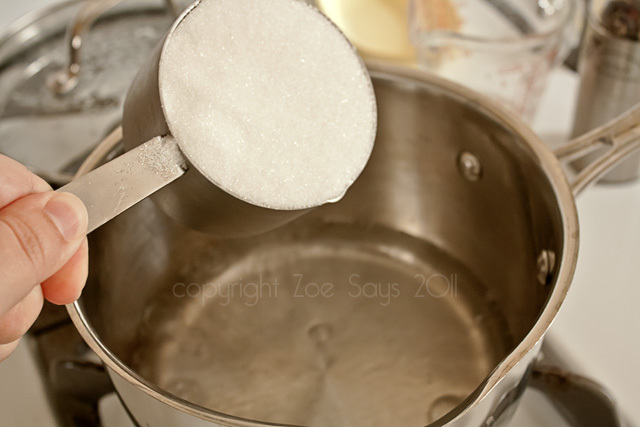 Slowly dribble the water back into the pot, looking for granules of sugar. I probably did this ten times or so, because I was paranoid I was doing this wrong. The liquid in the spoon looked nice and clear so after giving it one more quick stir, I turned off the heat completely and let it cool to room temperature. 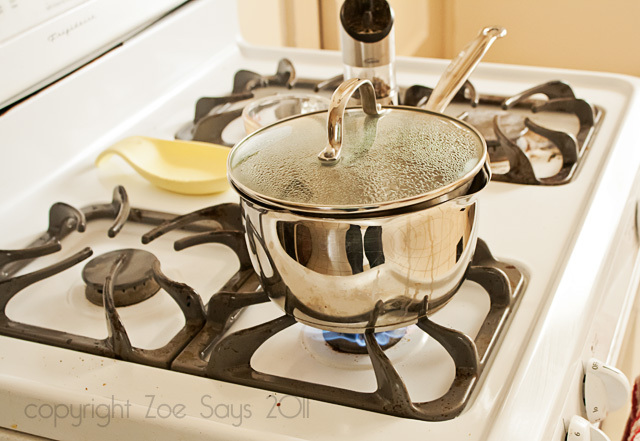 After it cools to room temp, pour your simple syrup into a jar and store in the refrigerator. And voilà! Not too terribly hard, right? I even had a jar to store it in, which was highly convenient. I gave a quick taste test and yep, it tasted like a clear, sweet syrup with no crunchy bits in it. It will NOT be super thick but it will be sticky as all get-out, so make sure you have a good spoon rest and wash your pot and spoon(s) right away. I’m excited to present the next installment of what I’ll be using this for later this week! Here’s hoping you enjoyed what was a lovely first weekend of autumn. For more information or to know where I got my instructions from, go here. MMM I want to try this!! And great job at making the recipe AND taking pictures at the same time! If I can do it, anyone can haha. We did a test run with what I’m using it for and it turned out great!